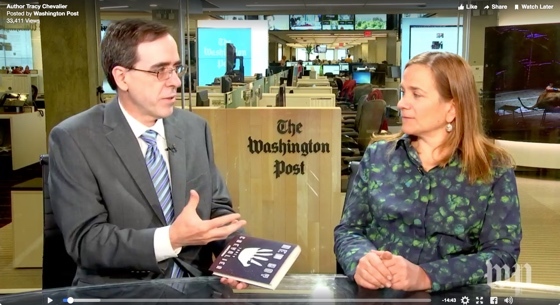 INTERVIEW about my novel New Boy with the Washington Post's 'Book World' editor Ron Charles. INTERVIEW with me and other authors about rewriting Shakespeare plays for the Hogarth Shakespeare Project. TALK by artist Tamar Stone about creating her Brontë Bed for Charlotte Great and Small, which I curated. FILM showing the layers of Tamar Stone's Brontë Bed, embroidered with quotes from the Brontë siblings' letters. TALK to a Financial Times journalist about making quilts, January 2014. Cat joins in. TALK at Capital Quilts, May 2013, about me and quilts and The Last Runaway. TED TALK about hidden stories in paintings, and how I got the idea for Girl with a Pearl Earring. INTERVIEW about my novel Remarkable Creatures. INTERVIEW about my writing habits.